RV Tire Safety: How fast can an ST tire run? How fast can an ST tire run? It's easy. Just run a drum test for a few minutes and you can claim the tire "passes" the requirement for the speed symbol. My point is that the fundamental basis for the load formula was developed back in the '60s & '70s when the National Speed Limit was 55 mph. To my knowledge there have not been any substantive changes to the formula since then, even though highway speeds are now much faster than 55. It is also important to remember that in 2002 other tires like LT and P type had a major overhaul of the regulatory requirements to make radials more robust, but it is my understanding that the RV industry opposed the application of stricter, modern requirements be applied to ST type tires. S5.5.1 After preparing the tire in accordance with S5.4.1, mount the tire and wheel assembly in accordance with S5.4.2.1, and press it against the test wheel with a load of 88 percent of the tire's maximum load rating as marked on the tire sidewall. S5.5.2 Break in the tire by running it for 2 hours at 80 km/h (50 mph). S5.5.3 Allow to cool to 38° ±3 °C (100° ±5 °F) and readjust the inflation pressure to the applicable pressure specified in Table II. S5.5.4 Without readjusting inflation pressure, test at 121 km/h (75 mph) for 30 minutes, 129 km/h (80 mph) for 30 minutes, and 137 km/h (85 mph) for 30 minutes." NOTE the above applies to a new tire only and the inflation in "Table II" is 2 psi below the max on the tire sidewall. Once a tire completes the above without visible failure it is considered to have "passed" the test. You will note the relative short cumulative time and that the test is on a new tire that has never hit a pot hole or curb, or been exposed to sunlight for weeks, months or years. S6.2.1.2.1 Press the assembly against the outer face of a test drum with a diameter of 1.70 m ±1%. S6.2.1.2.2 Apply to the test axle a load equal to 85% of the tire's maximum load carrying capacity. S6.2.1.2.3 Break-in the tire by running it for 2 hours at 80 km/h. S6.2.1.2.4 Allow tire to cool to 38°C and readjust inflation pressure to applicable pressure in 6.2.1.1.1 immediately before the test. S6.2.1.2.5 Throughout the test, the inflation pressure is not corrected and the test load is maintained at the value applied in S6.2.1.2.2. S6.2.1.2.6 During the test, the ambient temperature, measured at a distance of not less than 150 mm and not more than 1 m from the tire, is maintained at not less than 32°C or more than 38°C. S6.2.1.2.7 The test is conducted, continuously and uninterrupted, for ninety minutes through three thirty-minute consecutive test stages at the following speeds: 140 (86mph), 150 (93 mph), and 160 (99 mph) km/h. S6.2.1.2.8 Allow the tire to cool for between 15 minutes and 25 minutes. Measure its inflation pressure. Then, deflate the tire, remove it from the test rim, and inspect it for the conditions specified in S6.2.2(a). (a) There shall be no visual evidence of tread, sidewall, ply, cord, innerliner, belt or bead separation, chunking, open splices, cracking, or broken cords. (b) The tire pressure, when measured at any time between 15 minutes and 25 minutes after the end of the test, shall not be less than 95% of the initial pressure specified in S6.2.1.1.1." Note the test pressure in 6.2.1.1.1 is about 5 psi below the max on the tire sidewall. Also remember that an LT225/75R15 LR-D carries 15% less load than an identically sized ST type tire. I would ask what part of physics allows an ST to carry more load at the same inflation as an LT if all other conditions of use are identical?? Just making the container stronger doesn't result in increased load capacity even if it was the container that supports the load, WHICH IT IS NOT. It's the air pressure that supports the load else why have "Load & Inflation" tables. If it was the tire weight or mass we would have tire weight vs load tables. If you want to learn more about the speed rating test tire companies are using I suggest you read This post written by another tire engineer. Just got new Endurance tires with load range E instead of my ST215/75R15 Load Randg D OEM tires that were 5 years old. I now have a safety cushion for my 9,000-pound travel trailer. I'm still going to stay at 62-mph to keep my safety cushion plus get better mpg! 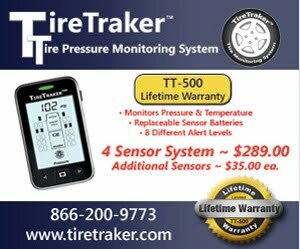 Why isn't my TPMS accurate? What is a good tire gauge?